The mobility division of New Line Products LLC, The Lift store USA, will now offer stair lifts designed for self installation in the United States and the Caribbean Islands. These stair lifts are easy to install and represent a significant savings over the cost of a professionally installed model. Due to the recent recession, the raging popularity of internet shopping, along with the ever-expanding “Home Depot demographic,” a new demand for a DIY (Do-It-Yourself) model has emerged. This vastly growing demographic includes handy individuals who enjoy working on projects around the home. For them, it is not necessary to spend hundreds of dollars hiring a professional to install a stair lift in their home. 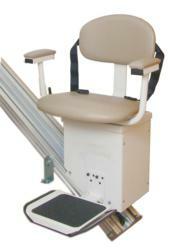 The Lift Store has announced that stair lifts for self-installation are now available. Only recently has this type of mobility lift been made widely available, as most manufacturers have only allowed their stairlifts to be professionally installed, forcing many customers to spend hundreds of dollars more on what many consider to be an unnecessary expense. But all that is in the past now that The Lift Store offers a line of DIY stair lifts from Harmar – a leading manufacturer of handicapped lifts. “Purchasing one of these highly affordable DIY stairlifts can save the customer up to $1000.00 or more – a huge advantage during these difficult economic times,” reported Dennis Corrado, Director of The Lift Store. They are also easy to install, requiring only a couple hours of time and a few basic tools. The Lift Store now features the Harmar SL350 Stair Lift – the leading DIY stairlift model in the United States. This model is made in America, has an industry leading standard 350 lb. capacity, and includes a 3-Year Warranty and free tech support from the manufacturer. Additionally, customers will enjoy other features, such as, smooth start/stop operation, folding seat and footrest, a wide, comfortable seat that rotates 90o at both top and bottom, and an optional D/C motor that will operate even during a power outage. The Lift Store also plans to announce the availability of a new premium DIY stair lift model from Harmar. This will coincide with their plans to open a separate division solely focused on the DIY market for handicapped lifts during the 2nd quarter of 2012.